Also like whales, this guy is enormous! Here’s a short video of a whale shark and diver, just to give you a hint on how big they are. Probably not much bigger, and most reports you’ll find are greatly exaggerated. But hey- whale shark size is still huge, and anything bigger than that is just about mind blowing! I rather like having the A&S posts every two weeks, with a shorter sort of preview post in between. It gives me more time to research on the chosen critter. Good research makes sure the critters are accurate to science, but also lets me know what I can speculate on the details. Hi there! Terry is here with us today, a rather odd looking critter isn’t she? If I asked you to tell me what she is, what would your answer be? Flying dinosaur? Terradactyl? Pterosaur? If you said Pterosaur then clearly you’ve done your homework. If not, don’t feel bad (I’m not pointing fingers), because the sad fact is that most books, movies, toys, and pretty much anything to do with dinosaurs always lump Terry and her many relatives into the same pile. Terry, like all pterosaurs, is covered in a fuzzy layer of pycnofibers. They’re made of the same keratinous proteins as our hair and fingernails. But they appear to be hollow inside, which makes them much more like feathers than fur. I say “appear to be”, because not everyone agrees. Most of the fossils are a bit squashed, and even the 3d fossils can be hard to tell if what fills the space inside was part of the living animal or just more of the fossil (or a part of decomposition after the critter died, but before it fossilized). Last week we saw the basic structure of a feather. If pycnofibers are indeed hollow, then that could mean that they are similar in structure to feathers. Terry and her many relatives are related to dinosaurs in the same way that crocs are related to dinosaurs (They are all Archosaurs). A bit like a great aunt. Since many dinosaurs are known to have feathers of various kinds, it would be pretty significant if pterosaur pycnofibers are determined to be feathers as well. 2. Hard Beak or Fuzzy Snout? Terry & Ron are both pterosaurs, but look very different from each other. Fuzzy snout vs. hard beak. The difference in texture of fluffy pycnofibers is my own speculation. We don’t really know what these might’ve looked like in life. Now I’m not quite sure where I first heard of the idea of hard-beaked pterosaurs…I think I remember Petrie from The Land Before Time had a beak. Come to think of it, I guess there are plenty of interpretations with beaky pterosaurs, but I’m not sure how many are based on fossil evidence. So why does Terry have a soft, fuzzy snout? Terry’s friend on the left is a Rhamphorynchus (that’s a mouthful, sorry, let’s call him…Ron). Some illustrate Ron and his wild relatives with just the toothless tip of his snout with a beak, but I’ve based mine off of Mark Witton’s lovely illustration. Honestly, it’s hard to imagine those crazy teeth with any kind of soft tissue, and that seems to be the argument for a hard beak over the bone. Pterosaurs had powerful wings, but their legs weren’t really strong enough to jump up to fly like birds. So does that mean they’re helpless on the ground? Not at all, look at Terry scamper around! Pterosaurs were Earth’s first pole vaulting masters. Their powerful wing-arms were strong enough to push their bodies (even the biggest ones) up into the air. Mark Witton proposes that even the largest, giraffe-sized pterosaurs could lift off from the ground. Many could probably take off from the water! Unlike birds, pterosaurs have most of their muscle dedicated to their wings. Birds need enough muscle in their legs to jump up before flapping, while pterosaurs pole vault into the air with the same power they use for flying. Quick Question: Ah, the nostalgia of so many movies and documentaries…I must say I still rather like the leathery, cliff-clinging bats in Fantasia (so many great retro-saurs in that one). Are there any pterosaurs from books or movies that have colored how you see these animals? 🙂 I’d love to hear your answer in the comments! These Camaras are more closely related to the smaller wild species, C. lentus (there are 3 🙂 ), which are only about 49 feet long. But that’s still a lot of sauropod on the move, especially when you multiply it by 80! Paleontologists may call Bella the ugliest sauropod, but they’re pretty popular for anyone with plenty of pasture. Their friendly and calm, cow-like attitude makes them an easier alternative to the larger giants like Elmer. If only they weren’t so loud! But some may call Bella’s singing endearing. It’s lovely to hear their chorus far out to pasture. I’ve kind of fallen into the bad habit of keeping right on the posts. It feels a bit like plugging holes in a leaky dam. As I get one done, then I’m scrambling to get the next one done, half afraid I won’t be able to keep up. Speaking of earlier posts, I used to have a list of future posts, and I would update information and write little snippets whenever I could. I’ve been kinda scrambling ever since I wrote all the posts on the list. It’s about time that we have a short chat on feathers. They are very complex, beautiful structures, and you could probably write entire books about them, but we’ll just cover a couple of things I didn’t know about until I researched it (Pretty cool when something so ordinary becomes amazing, just by taking a closer look). These feathers are like the peacock feather. The shaft, or rachis, branches off into many barbules, but those barbules don’t have the little hooks that ziplock together. Since Emu’s don’t fly or swim much, there’s no need for the streamlined contour feathers flying birds have. Emus have no problem with staying dry in the rain, because just like any other bird, they spend a good part of their day combing their beaks through their feathers and coating them with oil from a gland near the base of their tails. A sneak-peak for this week’s critter of the week. I’m afraid I’ve had a bit of trouble wrangling Bella. She won’t leave her friends when they’re in the middle of choir practice. Maybe it’s the squarish shape of her snout, her stout proportions, and that thick, kinda stumpy neck (for a longneck anyway)…but for some reason poor Bella is often quoted as the “ugliest of sauropods”. Beauty is in the eye of the beholder, and Bella certainly doesn’t care about beauty contests. She’d much rather sing with the other hundred Camarasaurus in the herd. Just sit tight and listen to those busy longnecks gossip. I’m sorry to keep you waiting, but just like any animals, these dinos can be a bit of a handful to handle. I’ll have to see if Pete will help me with the tractor…I’ll be back with Bella as soon as I can! 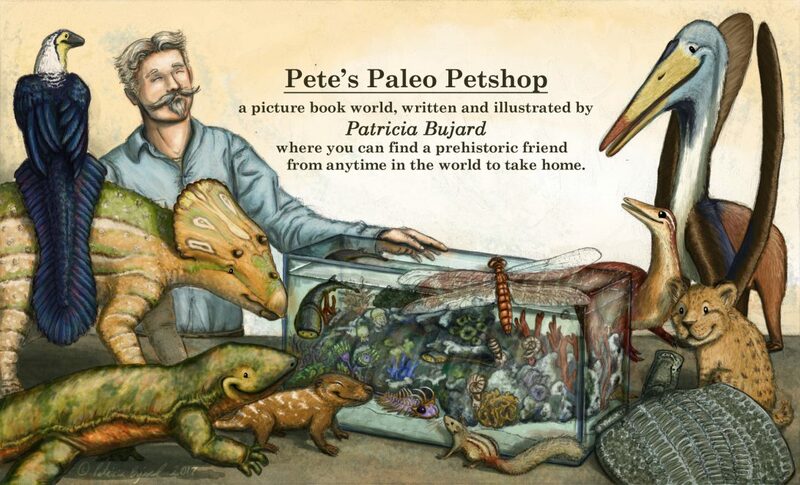 We interrupt our regular Monday program (The Art & Science of Pete’s Paleo Petshop) to give you a bit of quick behind-the-scenes sneak peak. I’m deep in the heart of picture-book production, and I’m at the point where I want to have the front cover all nice and shiny, so it can be the proverbial carrot at the end of the stick for me. First though, a quick (and brief!) rundown of what’s needed in a picture book cover. Visually appealing- obvious is of course obvious. What’s your first reaction when you see it? A resounding yes! Or…not quite hitting the mark? Gives hints about the story- it makes you want to know what happens. Text is clear, and can be read from a distance, or at least get you to take a closer look. Would you buy it if you saw it on a shelf? What’s your first reaction when you see the picture? Are there any questions you have about the characters or the illustration? Does it make you want to know more, or know the story behind it? With those questions in mind then, here is the sketch. And here is the colored version as I have it now. It’s only colored as much as necessary to get an idea of style and general look. It doesn’t have fine details yet. Thank you for swinging by my little corner of the internet, and thank you for taking the time to chat with me today. 🙂 I think it’s pretty awesome that indie publishing is an option, and that you can be a part of this. Twig may be small, but he’s not nearly as teeny as most “educational” sources would have you believe. Almost all the dinosaur books I’ve come across claim this little guy as the smallest dinosaur. “As big as a chicken” is the phrase often used. Twig would have you know he’s the size of a turkey, not a chicken (makes a big difference if you’re standing right next to it). All those other reports are actually based off a German fossil of a juvenile compy, not an adult. Another well-preserved fossil was discovered in France in the 1970’s, but paleontologists weren’t sure it was a compy until more recent years. Just for fun, here’s a picture of Jurassic Park’s Compsognathus. This picture is from the Jurassic Park Wikia, but did not have any credit associated with it. It looks like it was cut from a screenshot of Jurassic Park: The Lost World. It’s really quite a nice little puppet, and the film makers were able to give it the very lifelike, birdy movements described in the first book of the series. The model has a few glaring inaccuracies, but I really enjoyed watching it in the film anyway. Shrinkwrapped skin on muscle on bone, with no soft tissue in between. 1. Soft or hard-shelled turtle? Steggy’s a bit smaller than the average wild stegosaurus, but she’s still quite a bit taller than we are. If you reach up on your tip-toes you might be able to touch the biggest of her plates, the one right above her hips there. There’s been some speculation in recent years on if these plates were hard and covered in keratin- like a turtle’s shell or cow’s horn- or if the plates were soft and covered in scales or skin. I did a bit of digging (research wise), and came across this lovely gem of information written by Darren Naish. He cites a paper provided by Christiansen & Tschopp (2010), who reported a continuous sheath-like covering on one of the plates they referred to another spiketail known as Hesperosaurus. Hesperosaurus. A much smaller spiketail, but so close a cousin that there was a bit of disagreement a couple years back if it should be lumped in with Stegosaurus. So there you have it. Hesperosaurus is a very close cousin of Stegosaurus, so in the realm of phylogenetic bracketing that makes it more likely that Steggy had a smooth, hard sheath of horn on her plates and spikes. 2. Armed to the teeth. One of Steggy’s wild relatives, a Stegosaurus ungulatus to be exact. We should probably back off. He doesn’t look too happy that we’re so close. The same Hesperosaurus described had another very rare insight on spiketails- fossil skin. As you can see on Steggy here, most of her body is covered in small, non-overlapping scales, called tubercles. They look a bit like pave stones don’t they? Now look up here, a bit higher up on her side. Interesting isn’t it? thick skin with larger, armor-like scales (also useful for prickly plants) You can find the abstract for the paper describing the skin here. Short front legs can bring head lower to the ground (harder to reach) and spiky end up, or push the body up to swivel on powerful hind legs. Awesome for quick, sharp turns. No way a hungry predator can get to anything soft and vulnerable if that spiked mace is always between it and the stego. 3. She might not be the sharpest rock, but she’s one tough cookie. With all that armor, and tons of fossil evidence with some serious dino damage on Alfred‘s wild relatives, it looks to me that spiketails had an attitude to match their prickly array of spikes and plates. Just for fun, here’s my reasoning on why Steggy may not be as dumb as you think. A quick check on Youtube brings up plenty of smart tortoises. Yep, after discovering that it couldn’t fit through the pet door, this one figured out how to open a sliding glass door. Quick Question: Animals do all sorts of crazy things we wouldn’t expect. Do you have a story about an animal or pet that did something unexpected? I’d love to hear your answer in the comments!